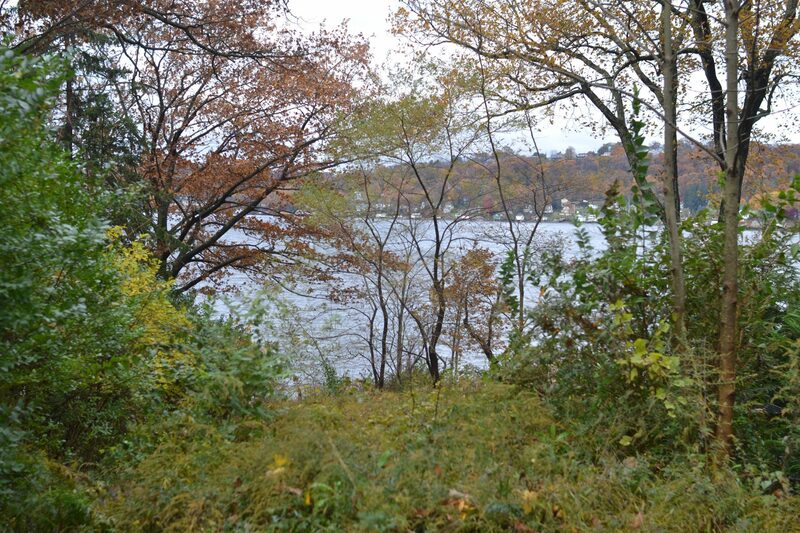 Lake Hopatcong would be a very different place had William McKinley died during his first term in office. 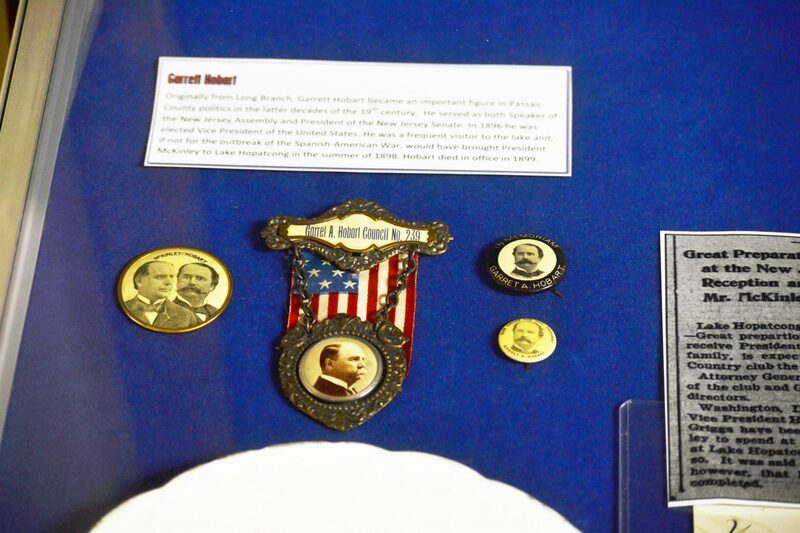 Campaign buttons from the McKinley/Hobart ticket. McKinley’s vice president during his first term was Garrett Augustus “Gus” Hobart, born in Long Branch and a long-time resident of Paterson. And memorabilia from their campaign was featured at the Lake Hopatcong Museum during its open hours on Friday, Nov. 2, and Saturday, Nov. 3. Hobart was a close friend of Albert Tilt, who had a summer cottage in Mount Arlington, the Bella Vista. He spent a good deal of time at the Lake, although, contrary to the old urban legend, never owned property there, according to Marty Kane of the Lake Hopatcong Historical Museum. He was a member of Club Breslin, later the Lake Hopatcong Club, a short-lived incarnation of the Hotel Breslin, later the Alamac, the giant hotel that was the anchor of Breslin Park in the newly established borough. According to Kane, his wife, Jennie, was an important figure in the Lake’s social strata. He was known as the first vice president to be considered an “assistant” president, according to the official United States Senate History website. Although he and McKinley didn’t know each other well when he joined the 1896 Presidential race to balance the ticket as an Easterner to McKinley’s Midwest persona and to represent business interests, McKinley soon developed a close professional and personal relationship with Hobart. The view from the back of the Bella Vista, much changed from when Hobart visited. Assembly and president of the NJ State Senate to become very respected in that role, according to the Senate history. In addition, Hobart and Jennie conducted much of the entertaining usually expected of the President and First Lady because of McKinley’s wife illness. The president and vice president socialized and McKinley was scheduled to visit Club Breslin when the Spanish American War broke out, cancelling the visit. After that war, Hobart broke a tie in the Senate that kept the Philippines a territory of the U.S. Although there are artifacts representing McKinley and Hobart at the museum, there is no trace of the banner that stretched across Howard Blvd. from the one-time municipal building according to “The Angler,” an early newspaper at the resort. “The Angler” also referred to Hobart as “our future vice president” long before the election. The Hotel Breslin was a scene of a Republican rally that summer as well. Hobart’s death on Nov. 21, 1899, in Paterson, caused McKinley to replace him with another Easterner, Theodore Roosevelt, who became president when McKinley was assassinated in 1901. Kane hopes the exhibit motivates other local collectors to bring their election items to the historical society. 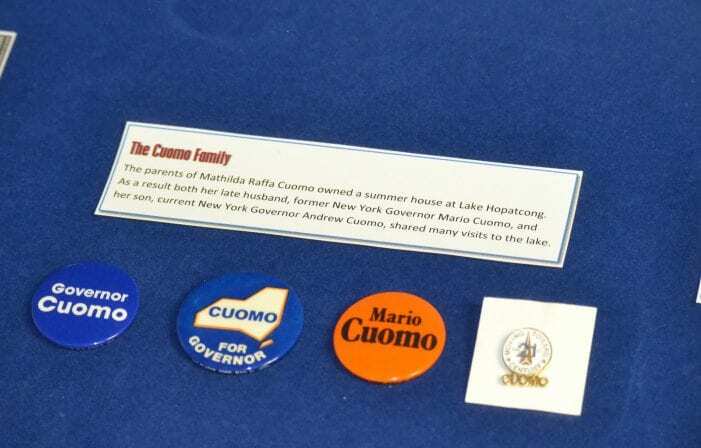 Campaign buttons for former New York Governor Mario Cuomo on display at the Lake Hopatcong Museum. One of the most familiar names in the collection is Cuomo. Mathida Raffa Cuomo’s parents owned a summer home on the lake. The widow of one governor of New York and mother of the current governor visited her parents with her family. The summers at Lake Hopatcong are mentioned in Andrew Cuomo’s autobiography. Kane wrote to him to see if he has information on his grandparents’ summer place. 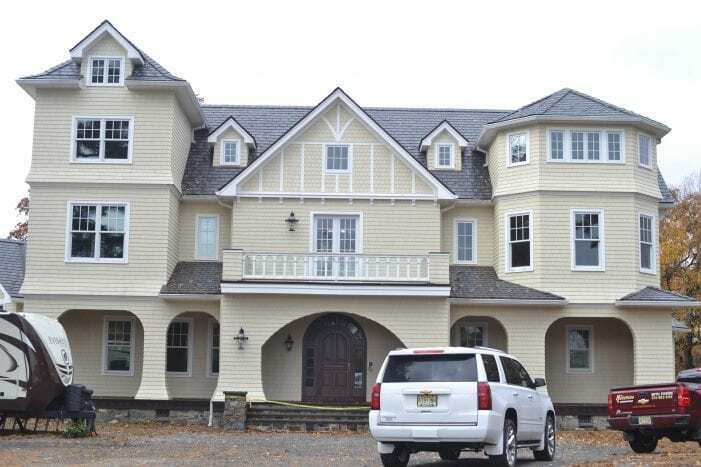 Former New Jersey Governor James Florio has spoken of visiting Hopatcong when his parents had a summer house there, but not much is known about that property either, Kane said. Other campaign buttons and memorabilia represented in the exhibit were those of John W. Griggs, state governor from 1896 to 1898 and U.S. Attorney General from 1898 to 1901. He was a frequent visitor to the lake and an officer of the Lake Hopatcong Club. George N. Seger was born in New York City but moved to New Jersey and represented the Passaic area in Congress from 1923 to 1940. He was a summer resident of Chestnut Point, also in Mt. Arlington. Carl Sherman, The N.Y. State Attorney General, owned Sister Islands from the late 1940s to the early 1950s. A frequent guest was cosmetic legend Helena Rubenstein. State Senator Lewis A. Thompson, who was Senate president in 1896, purchased a lot above Nolan’s Point, in Jefferson, and built a cottage he called Rockledge. Cornelius S. Hoffman, who represented Somerset County in the state Senate during the same era built a cottage on Halsey Island later converted to the Ardsley Hotel. The Kean family owned land near Raccoon Island which they had logged, but there is no record of them visiting the lake, Kane said.